Fennec is a large multi-national collaboration led by Oxford University that seeks to better understand the Saharan climate. As the dustiest place in the world and the locus of widespread extremes in temperature and pressure, the Sahara plays a key role in regional and global climate. Fennec places a special emphasis on delivering and employing new field observations in the remote desert. Prior to Fennec, an area of the Sahara of roughly 1 million square km had been void of any meteorological observations. Working together with the meteorological services of Algeria and Mauritania, Fennec deployed over 30 tonnes of meteorological equipment in the remote central Sahara (see map). In addition, 36 research flights were flown by the British BAe146 aircraft and 18 by the French Falcon aircraft, each of up to 5 hours in duration. The results of Fennec research done at Oxford and by partner universities are already changing how we view the climate of the Sahara. 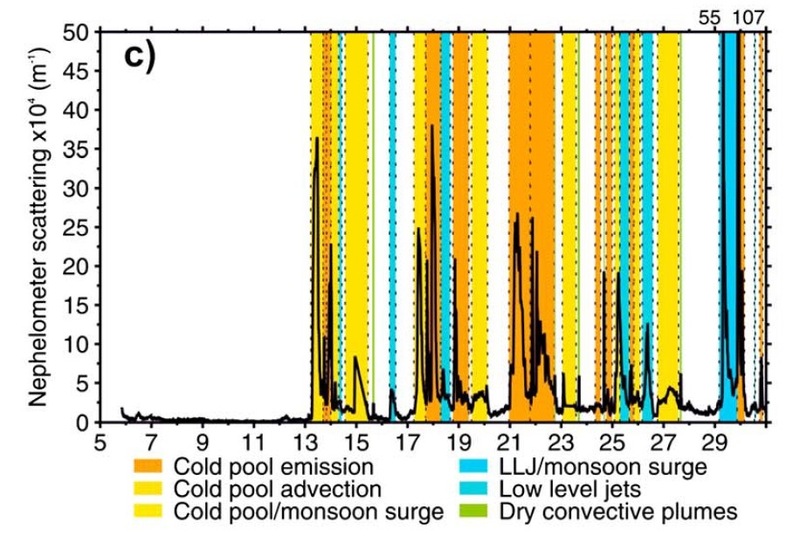 Summer Saharan dust sources as identified by Ashpole and Washington (2013). Warm colours indicate more active sources. Satellite retrieval is an important technique for learning about large and remote regions. Perhaps surprisingly, the location of dust sources in the central Sahara is still equivocal. By developing an automated satellite dust detection scheme and backtracking dust to its point of origin, Dr Ian Ashpole has produced an objective dust source map for the summertime central Sahara. Fennec datasets provide a unique opportunity to validate satellite retrieval algorithms and to understand their biases and limitations. Such research is being undertaken at Oxford and also at Fennec partner university Imperial College London. What are the atmospheric mechanisms that cause the central Sahara to be the summertime global dust maximum? Dr Christopher Allen analyzed the Fennec ground observations and came to a surprising conclusion: the most important dust-producing mechanisms were associated with water, specifically, the West African Monsoon. The monsoon could raise dust as an intrusive surge, promote low-level jets or, most commonly, supply moisture for thunderstorms whose downdrafts caused highly efficient dust storms known as cold pool outflows. Other Fennec institutions studying the dust mechanisms are Sussex University and the University of Leeds. The Saharan atmosphere in summer is characterised by deep, hot thermals, creating the deepest boundary layer on the planet. The vertical structure of the Saharan atmosphere and its temporal evolution is a focus of Fennec research. On a larger scale, Fennec is examining the processes that create, maintain or erode the Saharan Heat Low, a thermal low that extends across the desert in the summer months and is responsible for organising atmospheric circulation patterns across West Africa. Dust, clouds, and dust-cloud interactions modify how the Saharan atmosphere and desert surface are heated and cooled. The Fennec research aircraft provided unrivaled tools with which to measure these effects. A major finding was that dust particles were significantly larger than previously thought or measured – extending up to 300 microns in diameter. Such large particles were found to exert a much more potent heating effect than smaller ones. Fennec radiation research is led by the University of Reading. Dynamical models can be used to run experiments or to do forecasts. Fennec has made use of both; in addition it has made important contributions to model evaluation thanks to the new observation datasets. An significant finding from Dr Allen’s work is that model wind speeds – at the surface and in the lower troposphere – are typically underestimated compared to observations, with significant knock-on effects for modelled dust emission. Fennec was principally funded by the Natural Environment Research Council. For more details about the project, see the Fennec website. Ryder, C.L., Highwood, E., Rosenberg, P., Trembath, J., Brooke, J., Bart, M., Dean, A., Crosier, J., Dorsey, J., Brindley, H., Banks, J., Marsham, J.H., McQuaid, J.B., Sodemann, H., Washington, R., Optical properties of Saharan dust aerosol and contribution from the coarse mode as measured during the Fennec 2011 aircraft campaign, 2013, 13, 303-325, doi:10.5194/acp-13-303-2013, Atmospheric Chemistry and Physics. Washington, R., Flamant, C., Parker, D.J., Marsham, J., McQuaid, J.B., Brindley, H., Todd, M., Highwood, E.J., Ryder, C.L., Chaboreau, J.-P., Kocha, C., Bechir, M., Saci, A., Fennec – The Saharan Climate System, 2012, No. 60, Vol. 17, No. 3 p31-32, CLIVAR Exchanges.